CarGurus has 13,318 nationwide Prius listings starting at $857. Unchanged for 2014, the Toyota Prius hybrid sedan continues to deliver exceptional gas mileage of up to 51 mpg while offering a unique exterior design and a wide variety of standard features and options. Available again at One, Two, Three, Four and Five trim levels, the Prius holds the distinction as the best-selling hybrid in the world, with more than 1.5 million sold since its introduction in 2000. Currently in the midst of its third generation, the Prius last received a minor refresh in 2012. Although its mechanicals could use some updating and acceleration could be better, the Prius remains popular with buyers due to its exceptional gas mileage as well as its roomy cargo space, excellent reliability and good overall value. Power for the Prius continues to come from a Hybrid Synergy Drive, which was introduced in 2004 for the second-generation Prius and updated in 2010. The powerplant consists of a 1.8-liter Atkinson-cycle 4-cylinder gas engine and a 60kW electric motor. The gas engine produces 98 hp, which increases to 134 hp when combined with the electric motor. Combined torque tops out at 153 lb-ft. To maximize performance and fuel economy, the Prius can run on the gas engine alone, the electric motor alone or a combination of the two. Reviewers say the hybrid powerplant, which links to a continuously variable transmission (CVT), delivers smooth acceleration, although some find the Prius sluggish off the mark. Fuel economy numbers check out at 51 mpg city/48 highway. The powerplant includes 4 driver-selectable operating modes designed to ensure optimal efficiency in all types of driving situations. The four modes, including Normal, Power, Eco and EV, provide varying levels of responsiveness and fuel consumption. Normal mode delivers a balanced operation for daily driving, while the Power mode offers a sportier response. Eco mode provides the best fuel economy, while in EV mode the vehicle runs on electric power alone for about a mile. A multi-information display located on the dash keeps the driver informed of the mode of operation, as well as fuel and energy consumption. Since its debut, the Prius has displayed unique exterior styling, which makes it stand out in a crowd. Emphasizing function over form, the exterior design features windswept lines and a high rear end designed to improve aerodynamics. The Prius retains its coefficient of drag of just 0.25, which helps it slips through the air with minimal disturbance. Exterior features include projector-beam halogen headlights, with an auto on/off capability in the Four and Five trims. LED headlights come standard on the Five, and LED daytime running lights and taillights come standard on all trims. Heated power exterior mirrors and a rear spoiler are among the other standard features on all trims. An optional sliding glass moonroof, available on the Three and Four trims, includes solar panels, which power an interior ventilation system designed to keep the car cooler when it's parked in the sun. Due in part to small 15-inch wheels on all trims except the Five, the Prius has been criticized for its ride and handling, which can feel harsh and numb at times. The standard wheels include low-rolling-resistance tires, which help improve fuel efficiency but lack in road feel and comfort. A number of reviewers recommend the 17-inch wheels found on the Five, as well as on the special-edition Prius Persona series, which slots into the lineup between the Three and the Four. Upgrades to the Prius's suspension over the past few years have reduced body roll to an acceptable level, but some testers still find the power-assisted rack-and-pinion steering too unresponsive and the handling a little too loose. As in previous years, the 2014 Prius rides on an independent front suspension with MacPherson struts and a stabilizer bar, and a torsion beam rear suspension. Disc brakes are standard all around, with integrated regenerative braking. However, some reviewers say the regenerative braking system can affect brake feedback and feel at times. Owners seeking a sportier driving experience can opt for the dealer-installed PLUS Performance accessory package, which provides sharper handling and a sportier overall appearance by lowering the vehicle's ride height by more than an inch and adding a rear stabilizer bar and track-tuned springs. Inside, the 5-passenger Prius has a roomy cabin, with comfortable, supportive seats and good cushioning for longer trips. Passengers will find plenty of headroom and legroom in both the front and the back, thanks in part to contoured front seats, which ensure optimal legroom in the second row. The Prius offers plenty of cargo space as well, with a generous 21.6 cubic feet in the rear storage space when the 60/40-split rear seats are up. That puts the Prius at the top of its class for cargo space and nearly in SUV territory. 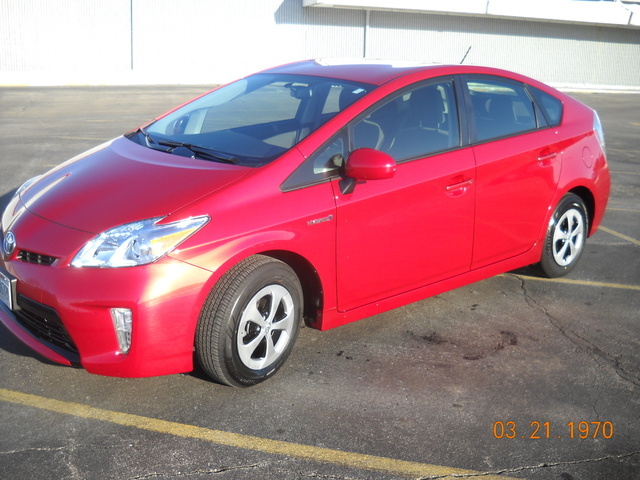 All Prius trims come well-equipped with a wide range of standard features. The entry-level Two, for instance, includes automatic climate control, a Smart Key system with push-button start, dual gloveboxes, cloth upholstery and a tilt/telescopic steering wheel with audio, cruise, Bluetooth and climate controls. In addition, a standard 6.1-inch Display Audio touchscreen integrates with a 6-speaker audio system, which includes a CD player, a USB port and an auxiliary input jack. The Two adds an upgraded Display Audio system with HD radio, SiriusXM satellite radio, a rear-view camera and Toyota's Entune App Suite, which provides access to Internet services like Pandora. In the Four and Five, Toyota upgrades the audio system even more to include 8 JBL speakers, as well as SofTex upholstery, heated front seats, an 8-way power-adjustable driver's seat and a 4-way power-adjustable passenger seat. 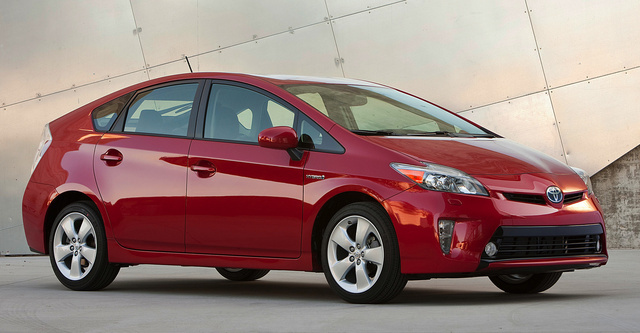 The IIHS named the 2013 Toyota Prius a Top Safety Pick, which should continue into 2014. The NHTSA similarly awarded the Prius an overall safety rating of 5 out of 5 stars. Seven airbags, including a driver's knee airbag, come standard, along with vehicle stability control, traction control and antilock brakes with brake assist and electronic brakeforce distribution. All Prius trims also include Hill Start Assist, which aids the driver when starting from a full stop on a hill. In addition, Toyota offers an optional Safety Connect service on the Four and Five trims, which includes such services as emergency assistance, roadside assistance and a stolen vehicle locator service. Other optional safety features include the Lane Keep Assist system, which reads the lane markers of certain roads and makes adjustments to keep the car in the center of the lane. What's your take on the 2014 Toyota Prius? Users ranked 2014 Toyota Prius against other cars which they drove/owned. Each ranking was based on 9 categories. Here is the summary of top rankings. Have you driven a 2014 Toyota Prius? The videos online to not accurately describe how to test the start up battery in our 2014 Prius. Can you please give step by step instructions? Can My Prius Sit For Two Months While I'm On Vacation? I will be traveling for two months and want to know if I need to have someone start the car to charge the battery. Did They Kill My Car?